Oh man, It has been a rough few weeks! Traveling, work, Christmas shopping, more work, baking (and mailing), even MORE work, so many December birthdays, and not to mention I dropped a full bottle of vinegar on my toe (which is now bruised and probably broken). I kind of just want to throw my hands in the air and say "I give up world!" But, I can't because..............SANTA'S COMING!!!! This is absolutely, hands down, my favorite time of year! Spending time with family, holiday parties, TONS of cooking and holiday treats, decorations, presents and best of all, traditions. We have several established traditions in our family, but we're always creating new ones. One of the best traditions though, are the holiday goodies that our families make. We always get delicious Italian Pizzelles from the Hubby's Mom and Spicy Chex Mix (aka Trash) from my Mom. 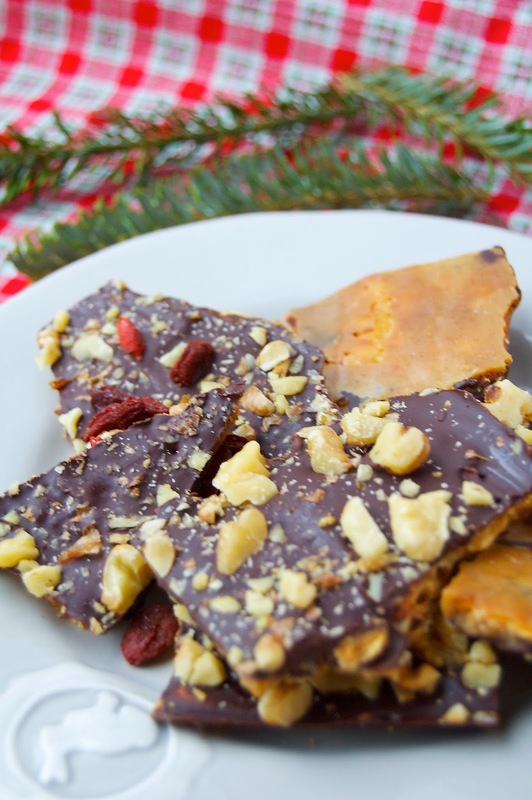 One of my favorite traditions that crept into our family several years ago is Angie's Brittle. Angie is an old family friend of ours who knows how to make brittle! 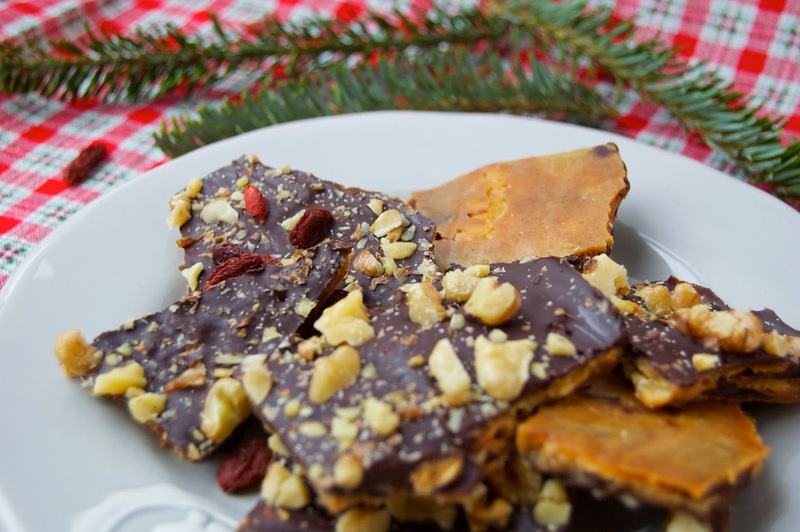 My mom fell in love with the brittle and started making it every Holiday. I now have taken over the tradition and wanted to share with everyone! 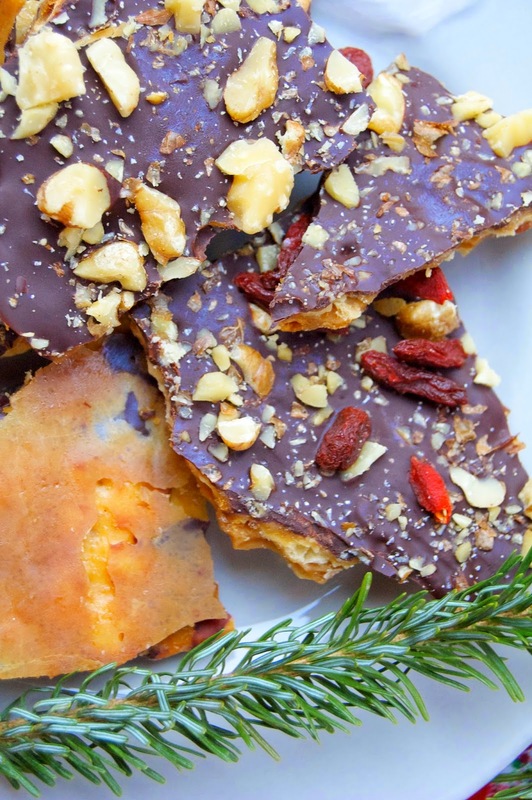 Salty, sweet and very chocolatey, it is a cracker-based brittle. Usually I make this with saltine crackers, however since going gluten free, I now use a basic GF cracker and had no issues. If you don't have a gluten issue, then go with the saltines. 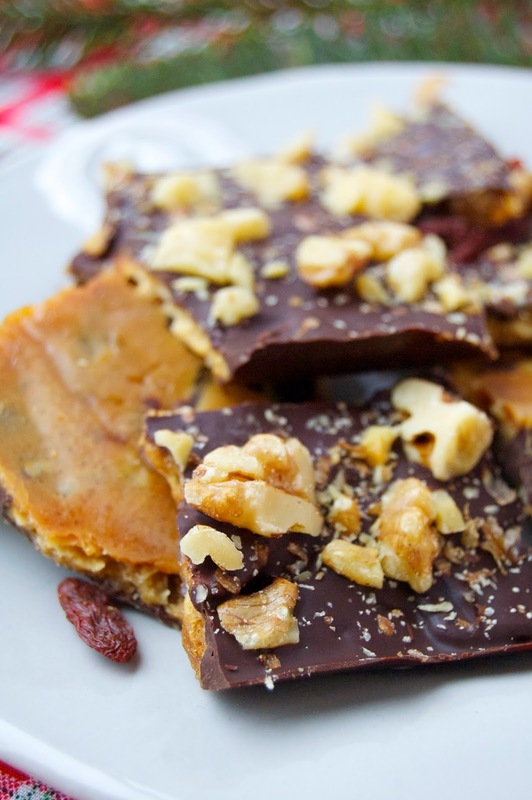 You can also top the brittle with a different type of nut like almonds, pecans or cashews. Sometimes I add on dried fruit, like goji berries. On behalf of the Hubby, myself and our families, we wish everyone a wonderful Holiday Season and many delicious treats!! Preheat the oven to 350F and line a large rimmed baking sheet with foil. Spray the foil with cooking spray (the more you spray, the easier it will be to remove the brittle). Spread the crackers in a single layer on the lined baking sheet. In a small sauce pan, melt the butter and brown sugar over medium heat. Bring to a boil and continue to cook for 5 minutes, stirring constantly. This will start to thicken and turn brown like a caramel. Pour the butter mixture over the crackers and bake in the oven for 10 minutes. Be careful not to overcook as the brittle will burn easily. 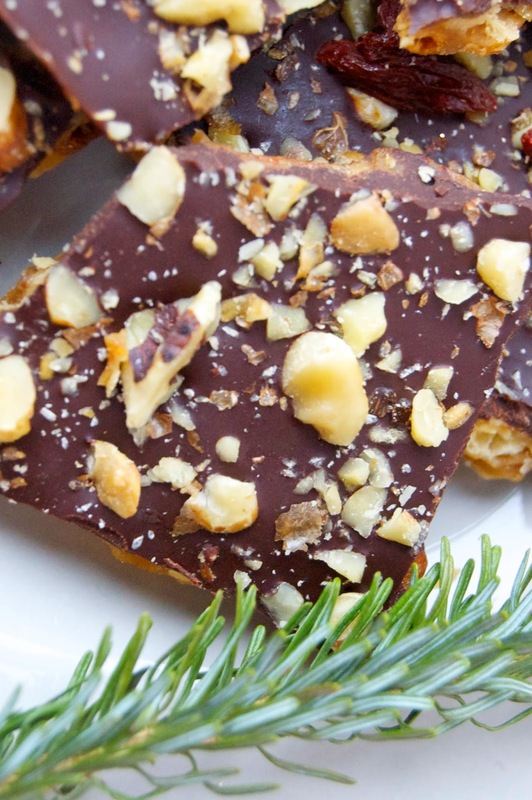 Remove the brittle from the oven and pour the chocolate chips on top of this immediately. Let the chips sit for a minute, and as they melt, start to spread them out with a spatula. This will create the chocolate layer. Sprinkle the walnuts (or favorite nut) and sea salt. Let this cool for about 10-15 minutes and then place in the freezer to harden. When frozen, carefully remove the foil from the brittle and break into pieces. Store in a freezer bag or container in the freezer until ready to serve. This keeps the chocolate from melting! This looks absolutely delicious (along with everything else you post). Thanks for sharing all of these wonderful recipes. Wishing you and your family a very merry Christmas!